When Andrew Essink didn’t have the funds to buy the guitar he wanted, a suggestion from his father changed the path of his life. There are almost as many reasons for choosing to build your own guitar as there are guitar builders, but choosing the self-build option because of lack of funds wasn’t what we expected when we asked Andrew Essink of AE Custom Guitars how he got started. I was actually starting to shop for a new guitar and realized that as a part-time employed college student I had no funds to purchase anything of quality that I started looking more in depth at the guitar, and when speaking on a whim with my Father he basically said well "why don't you build one." I really never second guessed him. Started immediately designing and researching,’ said Andrew. On a first build, keeping things simple is never a bad idea, and Andrew decided to do just that. ‘I also opted on the first to buy a Carvin guitar neck, so as to minimize need for specialty tools, but maximize my success. I did things pretty simple on that first guitar, but it turned out well, and I actually got to play it with my old band on stage and in the studio, but I kept wanting and started designing the next shortly thereafter,’ he explained. As with every guitar builder we’ve spoken to, Andrew is driven by a love for his craft and a desire to build the best guitar he possibly can, every time. 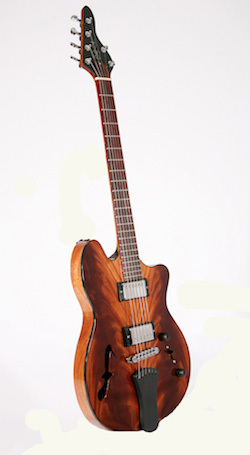 ‘All of my guitars are custom, one-of-a-kind designs, and are built by me in my shop one at a time. No fancy jigs, no computer tooling, just me! I take pride in that individuality, I consider the guitar my canvas’ he enthuses. Before we leave Andrew in his workshop, he has one more piece of advice for us, about tone: ‘Everyones searching for something different. 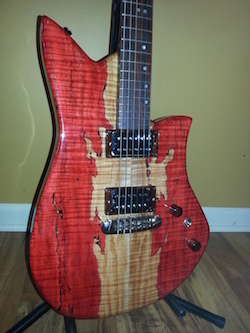 Tried and true building methods and designs are a good starting point, as is working with quality parts/tonewoods etc, but they must be maintained throughout the build, and the guitar must be finished and setup properly to achieve best transfer of vibration from the strings. If I do my part in designing/building/setup of the guitar then it will have the best tone possible, it is then left up to the cables/amp and the musicians themselves,’ he explains.